If you’re already writing and promoting your own blogs, but you need a new tactic to boost your blog’s visibility, start promoting with LinkedIn. Good content promotion strategies are essential to internet marketing success, and this method has been proven strategically sound by thousands of companies. For business-to-business companies, LinkedIn is a great place to find and showcase great information through open discussion. Let me walk you through the promotion of a typical blog on LinkedIn. Joining a LinkedIn group with your company or personal account is as simple as visiting the “Interests” tab on the LinkedIn homepage and following the “Groups” option. Within LinkedIn, there will be suggested groups, or you can search for groups yourself. When searching, use keywords relevant to your industry. Don’t choose groups who will not be interested in your actual blog content. People don’t use LinkedIn to find things to buy, so they don’t want to be marketed to. Choose groups that have a number of active members. A group that only has a few people in it really limits the total number of potential interactions for your blog promotion. Get into groups that make sense for you. Some groups might have people who are interested in your blog content, but will never use your company or share your blog with someone who will. This type of group is ultimately a dead end. If you join a LinkedIn group just for content marketing promotion, people will notice. Make the best of your marketing efforts by building genuine relationships and creating a name for your company in the industry. A little bit of realness goes a long way with LinkedIn. Remember, people in LinkedIn are probably just like yourself: looking to promote their own company, but willing to listen if people build a relationship with you. Provide value and be helpful when you participate in discussions. Don’t just add empty comments to pay your dues; the other members will see right through you. If you don’t participate in the groups, promoting your content on LinkedIn could have the opposite of your desired effect: you could get blacklisted for being a spammer. If you have been engaging in an intelligent and friendly way, do not give up that reputation at the point where you promote your blog content. Instead, post your blog along with questions and an open invitation for feedback from others. Invite people to talk with you about the subject first, and read the blog as a supplement. Do not hide the fact that you want to mention your blog, but don’t make your blog sharing a one-way relationship either. If people respond, keep the discussion going. There are few things better for your company than having people actively engaged with you on a subject where you are an expert. Don’t give up if you fail to see responses. If your posts add value to the groups, then the worst that can happen is that they are overlooked. Eventually, people may come to recognize your identity as a contributor, and begin reading further down the line. You may eventually want to post your actual blog to LinkedIn to get additional readership. This is a great follow-up tool, but let us give you a few pointers before you accidentally publish your content to LinkedIn too soon after your original blog. Best practices indicate to wait at least two weeks before re-publishing content to LinkedIn. Give your content time to live elsewhere, especially if the subject isn’t urgently time-sensitive. You do not want your blog post to be indexed on LinkedIn first, as the content on your page may appear to be copied, spam, or receive a lower search ranking for appearing second. So the big takeaway here is: once you publish your blog on your website, begin promoting on LinkedIn using the steps outlined above, but wait to post the blog to your LinkedIn profile until 2 weeks after it was published on your website. And here’s a final tip: use calendar reminders to remind you when 2 weeks has passed on your blog so that you can go back and publish on LinkedIn. Share articles by other authors and companies that do not profit your own business. Show the world that you are genuinely interested in your field, and that you aren’t just another LinkedIn narcissist feeding a work-related ego or trying to squeeze another dollar out of social networking. We recommend sharing at least one other article for every piece of content that you share of your own. Obviously, sharing more is much better than sharing less, but without an upper limit, at least try to make half of your promotion professional and not self-interested. 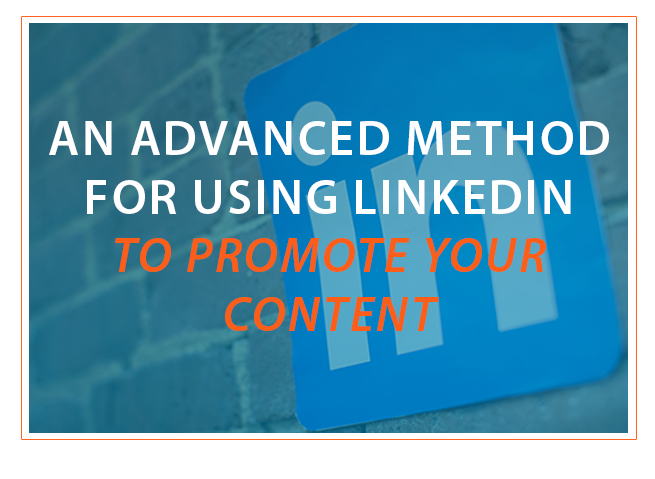 Finally, don’t just make your LinkedIn promotion a list of actions you take in hopes of generating more blog traffic. Write LinkedIn into your overall marketing strategy, monitor your performance, and verify how LinkedIn fits with your big picture. Subscribe to our blog to receive more great inbound marketing tips like this one!